Is the United States Ready for an Orbital Solar Power Station? This entry was posted in Energy and tagged Alternative Energy, solar power, space on March 26, 2014 by Sarah Moran. 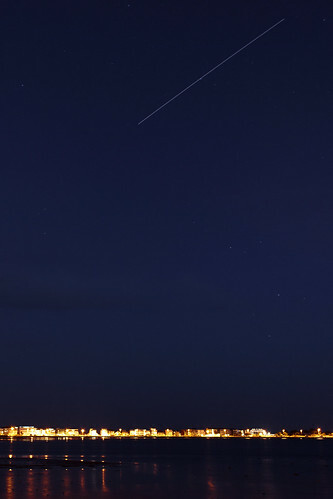 The ISS streaks across the sky over Sandbanks in Dorset, England. Image courtesy Chris Daborn/Flickr Creative Commons. On some clear nights, if looking up at the night sky, one might catch a glimpse of bright shining objects moving rapidly across the atmosphere, flashing in the dark like a collection of short-lived falling stars. This object is the International Space Station, its hulking football-field-sized metal frame and solar panel array reflecting light from the sun back to Earth. Not only will Steve “Swanny” Swanson Instagram from orbit aboard the ISS, he and his fellow crew mates use the internet, heat up their food, and breathe oxygen pumped throughout the station. All these tasks require power, but in space there are no coal plants or fossil-fuel burning electric plants, which contribute to global warming and dramatic upheaval for life where these kinds of energies do exist here on Earth. Instead, the ISS relies on the aforementioned solar array of eight panels to generate all energy needs during the typical sixth month stay of an astronaut on the ISS, which has been inhabited continuously by human crew members since November 2nd, 2000. That means for over a decade, the ISS has relied solely on space-based solar power to operate. This entry was posted in Energy and tagged Alternative Energy, solar power, space on March 12, 2014 by Sarah Moran. A concept for a space-based solar power satellite. Image © Mafic Studio, Inc.
“It’s amazing when you think of it,” said Adell. His broad face had lines of weariness in it, and he stirred his drink slowly with a glass rod, watching the cubes of ice slur clumsily about. “All the energy we can possibly ever use for free. Enough energy, if we wanted to draw on it, to melt all Earth into a big drop of impure liquid iron, and still never miss the energy so used. All the energy we could ever use, forever and forever and forever.” So begins Isaac Asimov’s short story, “The Last Question” wherein humanity has mastered the power of the sun, putting online a one-mile Solar Station in orbit that beams sunpower down to Earth, solving all of Earth’s energy needs in one fell swoop. Science fiction was the true birthplace of space-based solar power, which found a home in the minds of science fiction writers like Asimov who used such technology liberally in their fiction. It was not until a decade later that space-based solar power was first proposed as a legitimate scientific idea. First though, SBSP depended upon several key developments throughout the 20th century to even be considered conceptually. Space-Based Solar Power — A Viable Solution to Our Energy Crisis? This entry was posted in Energy and tagged Alternative Energy, solar power, space on March 5, 2014 by Sarah Moran. Twenty-two thousand miles above the Earth, an array of silicon glitters in the sunlight, quietly beaming power down to the planet below and providing energy to millions. One-hundred million miles away, a single photon leaves the sun, rocketing at the speed of light towards Earth. Upon arrival, the photon hits the silicon array of the solar cells in geosynchronous orbit, where the cell transforms the raw energy of the sun into microwaves, which are beamed down to a receiving station on Earth. Once at the receiving station, this power is fed onto the electric grid where it can now be used to power cities and homes. Behold, the possibilities of space-based solar power.